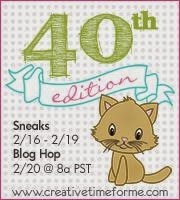 Liz's Paper Loft: MCT February Sneak Peeks Day 3 ~ hello! It's Day 3 of My Creative Time's February Release Sneak Peek! Well as you can see a lot of us on the design team have been in a watercolor mood this release ;) I hope you're not too tired of them since I have another one for you today! lol! 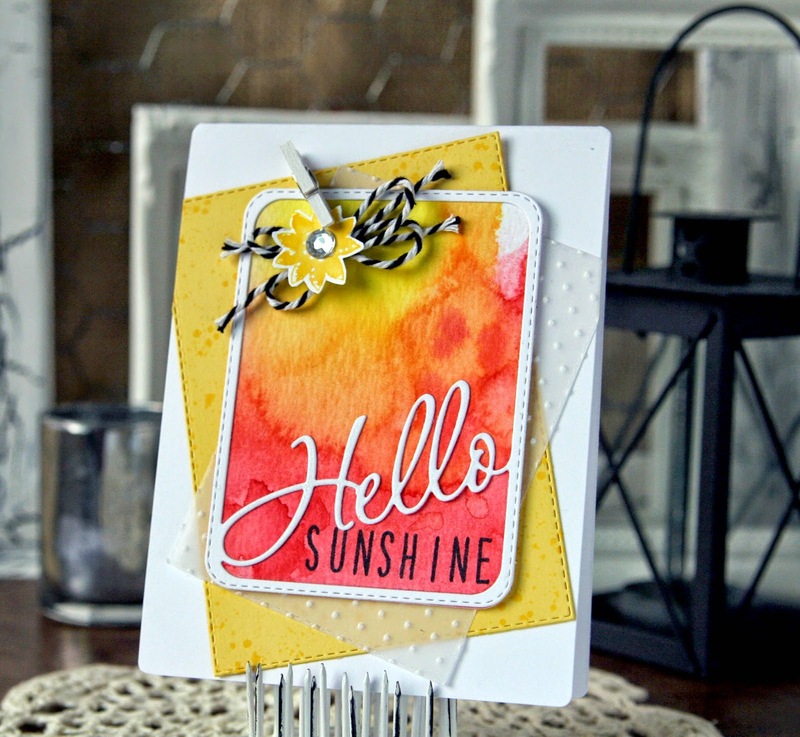 My card I'm sharing with you today is made with the new Hello Frame Die! This die fits perfectly with the 3x4 Journal Die, which is what I used to watercolor the background. I cut two Stitched Rectangle Frame Dies in small and medium. The small one is with vellum, then I used an embossing folder for more texture. I stamped the sun, then watercolored it with a little ink . Be sure to see all the projects for today's sneak peeks at My Creative Time. I'll see you tomorrow with more sneak peeks! WOW Miss Liz, this is SUCH a STUNNING & GORGEOUS card you created here my friend! Your watercoloring is AMAZING my friend! Such a very pretty card, love the colors! TFS! OMG Miss Liz What a gorgeous card!! Love the way you've used today's sneak peek...Your water color background is stunning and oh so pretty. You once again have done an outstanding creative job. YOU so ROCK!! Your Card reminds me of Spring or summer!!!!! Liz, you never disappoint. Everything you create is stunning. The watercoloring is beautiful! I love your use of the journal die. It's perfect! I love this release. This is super sweet and so cheerful! I love the water colored background and the string and flower add a perfect finishing touch. Totally love this card with it's awesome watercolor background. You put it all together so nicely with the elements. Love the watercolor and the embossed vellum. Great ideas. Thanks. This is so beautiful Liz!!!! Love the gorgeous colors!! Please send some of that sunshine over here...LOL!!! Gorgeous card! I love how you added the word "SUNSHINE"! It goes perfectly with your stunning watercolor!!! Love the sentiment you created! The watercoloring looks amazing! Such a bright and cheerful card! Love your water coloring, it reminds me of sunrises and sunsets and I never tire of seeing either of those. Beautiful watercoloring Liz, love this card, great job!! So pretty, LOVE the water colour!!! I love that watercoloring!!! Your card is beautiful! Oh WOW!! This card is fabulous Liz!! LOVE...love it! Love the watercoloring and the embossed vellum!! SO beautiful!! Love this Liz! Your card is so bright and sunny and just plain cheerful! Your card is beautiful. Love the colors and design. Thanks for sharing. 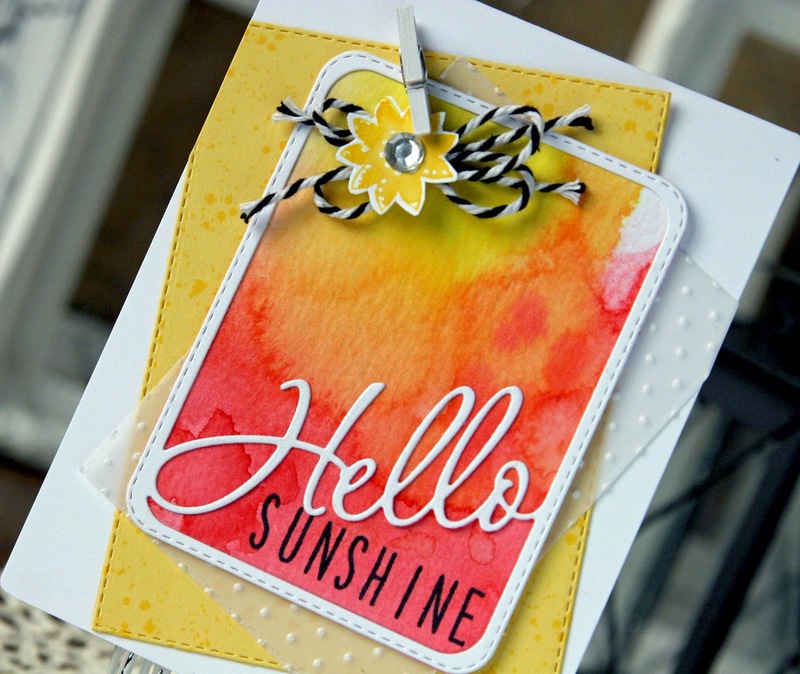 Very pretty, love the dies and the water color background so cheerful and bright! Beautiful card - the water coloring is so pretty! Fabulous card! Love the water coloring! Love the colors on your card so spring. Pretty, pretty, pretty! It has such a cheerful look to it with the beautiful water color background. Wow Liz, your card is so colorful and cheerful! I luv it! This would make anyone happy especially with the dreary weather we're having! Great Job ! Your card is so beautiful! I love the colors and the watercolor technique is so pretty. Love the accent og the vellum in the background! Very cheery--I like the watercolored background. I love the card. I think the colors that you used are great. Your card was truly lovely. up a very cold and wintery day here! The water color is a beautiful background for today's sneak frame die. I love the embossed vellum as a layer and the cute sun. Fabulous job! So pretty! Love the colors and your watercoloring is a lovely touch. I'm still working on the water color! Yours looks fab!!! Very pretty water color card. Beautiful! Love the watercolor! The colors are great together! I love your card, very colorful, thanks for sharing. I love the watercolor background you created! It reminds me of a Florida sunset! Liz ~ DIBS on this card too! Oh my its so bright, cheerful and HAPPY!! Reminds me there is sunshine even when we actually cant see it or feel it!! BEAUTIFULLY done!!! Gorgeous colors and details on your pretty card! I LOVE the Hello Frame die... awesome! Absolutely gorgeous Liz! I love the bright colors and the combo is just beautiful! Super fun release! Love the bright colors and how they blend together.